Gill, the daughter of Tyler and Sylvia Gill of Allensville, will be recognized Saturday (Dec. 15) as the Ogden Foundation Scholar during the Potter College of Arts & Letters ceremony. WKU’s top undergraduate academic award is presented to one graduating baccalaureate degree senior who has demonstrated exceptional academic achievement and outstanding university and civic engagement. Gill, who plans to begin graduate school in 2019, is a student in the Mahurin Honors College; participated in four study abroad trips to New Zealand, Austria and Ireland; attended a workshop at the Atlanta Center for Puppetry Arts and learned about the history and craft of puppetry; designed props and puppets for the Phoenix Theatre in Bowling Green; interned at Mammoth Cave National Park; and volunteered with the Governor’s School for the Arts. Her awards and scholarships include the Art Department’s Schierferdecker/Lester Award, the Jarve Endowment Scholarship for study abroad in New Zealand, WKU’s 1906 Founders Scholarship and the Potter College Outstanding Student Award in Visual Studies. Her work also was selected as the official logo for WKU’s International Year of Cuba. Gill finds inspiration in strange or extinct animals, landscapes, farm life, music, folktales and fairy stories of writers like Hans Christian Andersen, Oscar Wilde and C.S. Lewis. 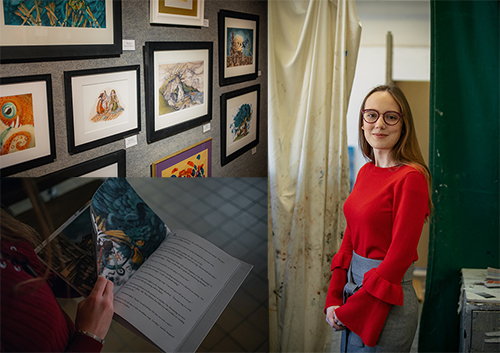 Illustrations highlighting those inspirations -- as well as her first piece of artwork, a finger painting done as a toddler in 1997 -- are on display in the graduating seniors exhibit at WKU’s Ivan Wilson Fine Arts Center.